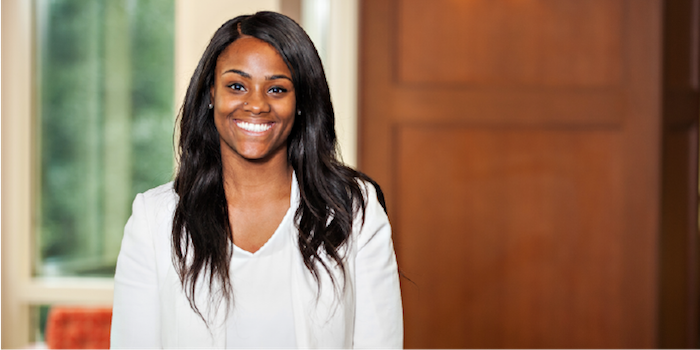 Marsha Ambroise (JD ’19) discusses her experiences at Wake Forest Law, including her involvement with the Black Law Student Association (BLSA), the National Trial Team, and the Pro Bono Project. She also talks about her decision to attend Wake Forest School of Law. Where did you work during your 2L summer and what was that experience like? I was a summer associate at Drew Eckl & Farnham in Atlanta, Georgia. I worked on a variety of projects that span many areas of law. I found the fact patterns in workers’ compensation and general liability really interesting. I also enjoyed how often we attended mediations, depositions, and hearings. This experience definitely provided a good balance of working in the office and out of the office. I started my days by checking emails and beginning work on projects that partners had assigned to me. I usually had lunch with an attorney at the office to get to know them more. Once the work day was over, it was usually followed by a weekly firm event such as a cooking class, happy hour, sporting event, or something else the firm had planned. Describe your 1L summer experience. I spent the first half of my summer at Poyner Spruill LLP in Raleigh, North Carolina. During the second half of the summer, I clerked for a judge at the Fulton County Superior Court in Atlanta, Georgia. I decided to come to Wake Forest Law, because of the name recognition and the personable alumni that I met. Initially, I wasn’t too sure if I wanted to practice in North Carolina or Georgia, but I realized that attending a great school like Wake Forest would give me the opportunities to choose either. My most memorable experience has been attending the Black Law Students Association (BLSA) banquets in the spring every year. It’s great having a supportive faculty and dean who attend events like these and carry out the diversity goals of Wake Forest Law. I’m involved in BLSA, the Know Your Rights Pro Bono Project, the Journal of Law and Policy, and the National Trial Team. I think that being involved has added a lot to my overall law school experience, especially by exposing me to law students who I hadn’t had the opportunity to meet beforehand, and giving me topics to discuss at my internships or with employers. I usually hike, do Crossfit, listen to podcasts, or host events to hang out with friends. I want it to take me to the private sector in Atlanta, Georgia.